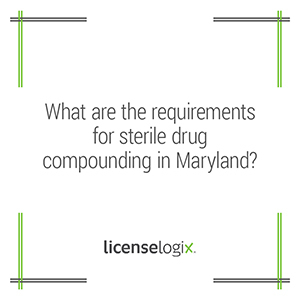 Effective January 1, 2015, any sterile compounding facility that performs sterile compounding for dispensing to Maryland patients will be required to obtain a Maryland sterile compounding permit. An entity in Maryland that performs compounding of sterile drug products for office use, or other distribution, will be required to obtain a Maryland wholesale distributor's permit and a FDA registration or permit. Maryland defines Sterile Compounding as "compounding of biologics, diagnostics, drugs, nutrients, and radiopharmaceuticals that, under USP 797, must be prepared using aseptic techniques." To obtain the permit, an application form must be completed and submitted to the Maryland Board of Pharmacy that includes the applicant’s name, address and contact information, practitioner license number, and the highest USP 797 risk level of compounding engaged in by the applicant and the required fee. See the Maryland Board of Pharmacy website for more information. This permit is required in addition to a pharmacy or wholesale drug distributor license in Maryland. What does this mean for your establishment? Contact us today to find out. We will help you to streamline the process and save time! UPDATE: The Maryland Board of Pharmacy voted to postpone the effective date of its regulations governing the Sterile Compounding Permit Program (COMAR 10.34.19 and 10.34.09) from Jan. 1, 2015, to July 1, 2015. As such, the Board will not accept applications for sterile compounding permits (or waivers thereof), nor enforcing permit requirements until July 1, barring any legislative changes. Notice of this postponement will be published in the Maryland Register as an Errata in the Dec. 26th publication.